Steganographic systems use Syndrome Trellis Coding (STC) to control the selection of embedding positions in a cover, subject to a set of stochastic constraints. This paper reports observations from a series of experiments on the ability of Syndrome Trellis Coding to approximate independent Bernoulli random variables. We find that approximation errors are generally small except for some outliers at boundary positions. Bivariate dependencies between embedding changes do reveal the use of the code and its parameters. While risky outliers can be hidden by permuting the cover before coding, or avoided by using the proposed “outlier corrected” variant OC-STC, the aggregate bivariate statistics are invariant to permutations and therefore constitute a potential security risk in the presence of powerful attackers. Alexander Schlögl helped us with implementing STC on the HPC. Pascal Schöttle and the anonymous reviewers of IWDW provided us with very valuable comments. The computational results presented have been achieved using the HPC infrastructure “LEO” of the University of Innsbruck. 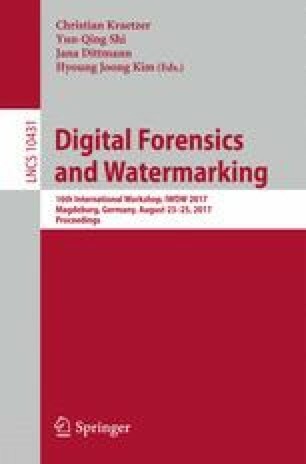 This research was supported by Archimedes Privatstiftung, Innsbruck, and by Deutsche Forschungsgemeinschaft (DFG) under the grant “Informationstheoretische Schranken digitaler Bildforensik”.